No other artist like Fidel Sarmiento has brought the luxury of visual art to the people from Bukidnon to Bilibid, from schoolchildren to seniors, demystifying and mystifying the process of painting yet simultaneously encouraging the pursuit of artistry embedded in the Filipino’s DNA. Wielding his painterly wand, he demonstrates how colored pencils or pastels on paper, even a household sponge dipped on house paints and swiped on canvas, can bring out another Amorsolo. Then, he distributes pastels and paper paraphernalia, and with his group of artists coach the audience living behind bars, or tribal people, or awed grade schoolers. Yes, he makes it look so simple as shooting hoops street style with visions of LeBron. Sarmiento, the Wizard of visual art, appears to be on a mission. Hence for the past years, he tirelessly traverses the islands influencing as many people as he can with his style of Painting 101. But he humbly says, “Wala po akong mission. Ang maibahagi, maituro sa iba, at magamit sa makabuluhang gawain ang talentong binigay sa akin. Bahala ang Diyos kung saan ako magiging kapaki-pakinabang.” Adding, “Alagad lang po ako ng sining.” (I have no mission but to share and to impart God’s gift. God shows the way as to where I’m needed. I am just a keeper of the art). 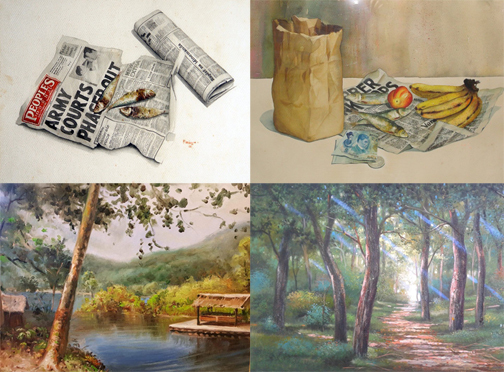 Fidel Sarmiento's paintings showcase the talent of a true Filipino artist. 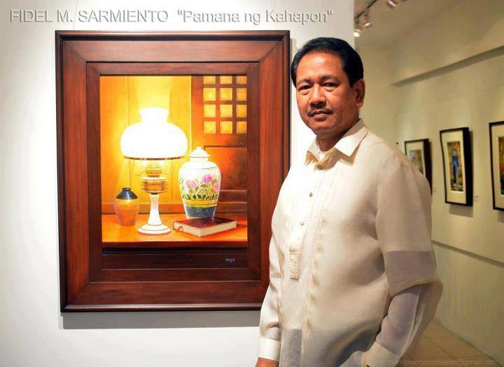 Sarmiento is president for 16 years of the oldest artist group, the Art Association of the Philippines, he forged with the Government Service Insurance System. For the on-the-spot painting contest held annually since 2004, people of all persuasions spill out of the hallways of the reclaimed bay area GSIS offices to the multi-level entrance steps, creating masterpieces from daybreak to dusk for the coveted honor of winning over thousands of other artistic hopefuls. Sarmiento and his officers continuously market AAP members' works by collaborating with various organic galleries, medical groups, and foundations to benefit charities like the San Lorenzo Ruiz Home for the Elderly. Almost every month, the indefatigable visual virtuoso holds an outreach program, the latest organized by Governor Joe and Vicky Zubiri in Bukidnon for the Manobo tribe. 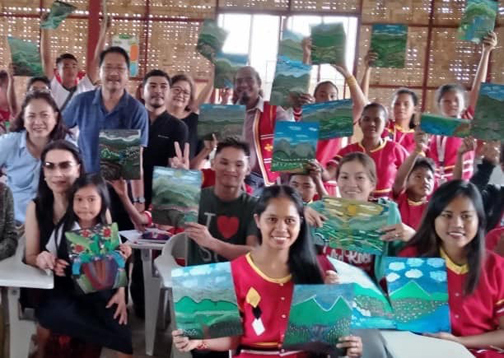 In December last year, he led a plein air painting in Baguio with a group of seniors headed by former Makati Vice Mayor Conchitina Bernardo. This February, he is the inaugural artist of Happy Garden Cafe, a wellness destination along Jupiter St., Makati. During Edsa Shangri-La’s 2019 Chinese New Year events, he led AAP members impart the beauty and speed of producing oil pastel artworks to an enraptured crowd. Yearly, inmates blend oil pastels with him and AAP members. 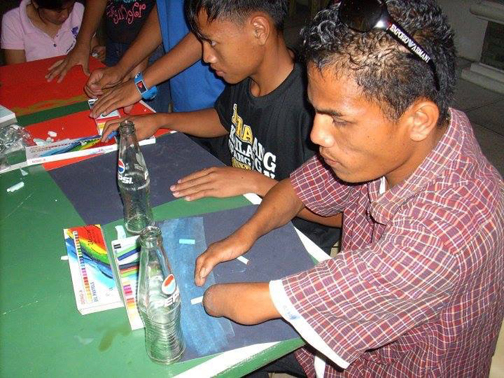 Three years ago, he painted with Ormoc schoolchildren hosted by Congresswoman Lucy Gomez. Two years past, he exhibited in Honolulu with artist/actress Heart Evangelista for the 119th Philippine Independence Day. And for quite a number of years, he juried and showed in Seoul, Korea. Just turned 59, he has traveled and enthralled the world with his canvases from Europe to America to Asia, winning awards for himself and the country. Everyone gets a chance to paint. Such is the spectrum of Sarmiento’s reach. No one too low or too high, too healthy or too sick, to be touched by the healing and enriching art of painting. On his fifth year as the Wizard at Sunshine Place, he enchants the seniors on four wheels, a third leg, or on active twos, rejuvenating their endorphins on colorful canvas glory. The five-story Sunshine Place along Jupiter St. in Makati is a foundation built by SM’s Tessie Sy Coson in honor of her mother and all mothers. Its president, Lizanne Uychaco, a bank executive and the country’s foremost feng shui mixed media artist, asked Sarmiento to be the resident art professor. Quite a storyteller, Sarmiento recalls how it all started...his childhood days of chalking all sorts of images on pavements and streets, his high school days of drawing teachers’ portraits instead of listening to lectures, bolting out of architecture’s rigid structure in his first year at Mapua to the fine arts classes of FEATI where he graduated. 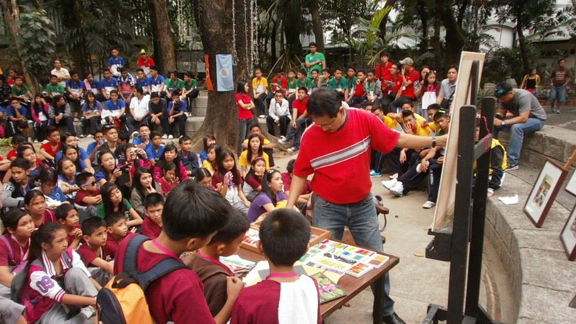 Sarmiento does outreach program in various communities, promoting the healing and enriching art of painting. His innate artistic genius honed by decades of painterly experience is evident on canvases of stunning details, perfecting the yin and yang of clean lines and soft caressing colors. Every day in his Sta. Rosa abode, Sarmiento makes magic with his brushes, incorporating his signature trademarks into timeless pieces. - The “masking tape” symbolizing “holding on to the past” is a perfect trompe l’oeil. - Larawan ng Kahapon is a picture on picture canvas of the past with ribbons of the sky the sun the sea the earth. - Pamana: A photorealistic painting of a living room with polished wooden floors and displays of porcelain jars, books, lamps, and Amorsolos. - Alaala Ng Lumipas: Ruins of a bahay na bato, a pigeon perched on a jar, fronting harmonious color gradations. - Buhay Pinoy and Tag-Tuyo Na Naman: dried fish on old newspaper, few peso bills, and a paper bag. With a sleight of hand, the Wizard gazes at leftover colors on a palette and in a minute transforms them into another collectible work of art—a blue vase with delicate flowers or nine kois swimming toward a lotus flower. Sarmiento desires the viewer experience to go beyond the colors and the canvas. He shares, “Gusto ko makita at maramdaman nila na ang aking obra ay likha ng Filipino artist. Gusto kong maramdaman nila hindi lang ang ganda ng kulay kundi pati na ang mensahe.” (I want the audience to look at my works and know they are done by a Filipino artist, and not just to admire the beautiful colors but to get the message). The fortitude of gratitude is immensely infused in his being. That’s Sarmiento, the People’s Artist.